(From Sigma lens literature) This high zoom ratio lens is exclusively designed for digital SLR cameras and capable of covering a wide range of focal lengths from wide-angle to telephoto. Two Special Low Dispersion (SLD) glass elements and two hybrid aspherical lenses offer the utmost correction for all types of aberrations, and enables this extended range super zoom lens to be housed in a compact and lightweight construction of 70mm (2.8 inches) diameter, and 78.1mm (3.1 inches) in length, and weighing just 405g / 14.3oz. The new lens coating reduces flare and ghost, which is a common problem of digital cameras and also creates an optimum color balance. This lens has a minimum focusing distance of 45cm (17.7 inches) at all focal lengths and has maximum magnification of 1:4.4. The lens design incorporates an inner focusing system, which prevents the front of the lens from rotating, making it particularly suitable for using circular polarizing filters and petal shaped lens hoods. The overall length of the lens does not change during focusing, ensuring convenient handling and ease of use. A zoom lock switch eliminates "zoom creep" during transportation, a convenient addition when traveling. Note: A motorized Nikon version compatible with all Nikon DSLRs including the D40 and D40x was announced 12/19/07. This is Sigma's version of the 18-200mm "vacation lens", competing against a similar model from Tamron, as well as against Nikon's 18-200mm VR design. Like its competitors, this is a reduced image-circle lens, designed for use on cameras with APS-C sized sensors. Because of this, it's relatively light and quite compact relative to its exceptional zoom range. As I'm fond of saying, there's never a free lunch, especially with lenses, and in the case of the Sigma 18-200, the tradeoffs are very soft corners at maximum aperture and wide to medium focal lengths and somewhat high geometric distortion across a range of focal lengths. The good news though, is that the center of the frame is always quite sharp, and stopping down by one or two f-stops dramatically improves corner sharpness. Making precise comparisons between zoom lenses is difficult, because their behavior varies so widely with focal length: One lens may do better over part of its range than another, but the relative pecking order could be opposite at other focal lengths. This is true of the three lenses in this particular competitive bracket, but it does appear that the Sigma 18-200 is sharper across more of the frame, across a greater range of focal lengths and apertures than its competitors, especially toward the telephoto end of its range. As I admonish in my other "vacation lens" test analyses, it's important to consider this lens' intended market and its very affordable price point when calculating the bottom line for it. Can you do better with multiple, more expensive lenses? Without a doubt. But if space and convenience are overriding concerns on a long trip, softer corners in images may be an acceptable price to pay. Possibly even more important than the sheer convenience factor though, is the security of not having to worry about dust entering your camera body as you swap lenses on and off in less-than-clean-room environments. - This is actually a fairly serious issue with digital SLRs, as dust on the sensor will show up in every shot you take, and your ability to clean your camera's sensor is likely to be severely limited while traveling. The bottom line? : If you need to just put one lens on your camera and leave it there, yet still want to cover a focal length range from wide angle to a pretty long tele, this lens is a very good, affordable solution, offering better optical performance than its competition over much of its range. Recently I compare the resolution of tis lens with the other lenses I have (Tamron 17-50 and Tamron 70-200). One of the measurement that I made was the amount of sensor pixels per 1 mm of actual target (same for all shots and lenses). I use Sony alpha 350 camera. To my surprise I found that Sigma actually is not 18 - 200 but rather 18 - 135 and in my version also has about a foot backfocusng. If backfocus may be the feature of my particular lens, the deviation of the focal distance from assigned scale is the property of lens construction. For 200 mm the resolution should be arount 20 and it is only 14.5 which makes tese lense to have focal region from 18 to 140 only. Do a lot of outdoor activities and changing lens is a real pain. I bought this lens because in the midst of changing a lens I would often miss the shot. That's the real issue because getting the photo trumps the pixel perfect image quality. Sure spending $10000 on great lenses will get the quality. Give a great photographer a point and shoot and a lousy photographer the best photo equipment on the planet and what happens? A lot of great point and shoot photos that can't be printed past 8x10 and a lot of lousy photos that can be printed to the size of a billboard. (well maybe not quite!) Anyway this lens has it's place and it does take great photos depending upon your ability as a photographer! This lens is on my SD14 most of the time. It was purchased before all the different OS versions came out. Wish I had one of those instead. This one is can produce really nice shots. Typically I have to stay a least one stop away from the largest available, and usually try not to get all the way extended at the 200 mark to get better results. I still really enjoy this lens. It has worked very well for me over the years. I recently bought a secondhand copy of this lens with a view to using it on days out when changing lenses frequently would just be a pain. I was lucky enough to be able to buy it on an if its rubbish bring it back basis so I took a chance. Having made 60 or 70 shots with it and printed a fair few to A4 I have to say its pretty good, certainly better than reviews would have you believe. The drawbacks of what is a slow lens with no IS are fairly obvious, but with care and common sense it is possible to get some pretty good results from it, and it is damn convenient. It serves the purpose that its manufacturers intended it for very well, and it has a zoom lock which does prevent the irritating zoom creep that just about every superzoom I have ever used suffers from. In short for days out or holidays where convenience is preferred to ultimate quality, and you wont miss shots lens changing it fits the bill admirably. I wont be returning it. I upgraded from Canon kit 18-55mm USM to Sigma 18-200 and are very satisfied with the upgrade. I bought this over the Tamron 18-200. When i compare theese side by side it seems Sigma 18-200 is better in important areas like 200mm f6.3 and center sharpness. This is slightly more compact (16% less volume) then Tamron 18-200. Better sharpness at f6.3 200mm then Tamron and doesnt have a rotating front. Aperture priority f/8 and a steady hand is a good option in daylight. Good vacation lens for outdoor use. Inside you should consider using high ISO and flash. I wasn't really sure what this 'walkaround' lens could offer at this price point; but, it performed fairly well. The metal base is a plus, and it's definitely the best choice 18-200mm lens for our Pentax K10D. Face it, the vast majority of us won't be shooting test shots under controlled conditions in a studio, and looking for spectacular sharpness from edge to edge, without noticeable vignetting. So, don't get hung up on studio test shots when evaluating lenses. After shooting several thousands of photos over the past two months, I have found the 'standard' of f8 through f11 to be the optimum aperatures across the entire focal range. No surprise there. But, you can still use a faster f stop with good results. Especially with the K10D which features a sensitivity shooting mode, and image stabilization is built in. The great thing about photography technology these days is the excellent software packages that allow us to make key adjustments and compensations for distortion, vignetting, and sharpness issues for the shortcomings of 'budget' priced lenses. If you're seeking absolute perfection, you'd better pass on this lens. But, if you want better than average results and can't justify forking over $750 to a grand for a comparable competitor's zoom lens, give this one a try. Finally I bougt some years ago the cheaper and better 18-125. This one had horrible distortion and strongest cornershading. The resolution was acceptable between 18-120, AF slow and noisy and the pricetag was terrible with 400$. I don´t understand the popularity of this low middle-class-lens, not recommended! Very useful zoom range, reasonable image quality, correct build quality, price. Distorsion at the wide end, softness at the long end, 6.3 max aperture at 200mm, some AF problems at 18mm. I own a 18-125 and had an occasion of comparing it with my friend's 18-200. "I bought this lens to replace the kit lens of my EOS 300D, and it outperforms it in every domain. This focal range is extremely convenient as a walkaround lens and perfectly suits my needs (but I'd love a wider aperture too...). Image quality is good wide open under 70mm, and sharp on the whole focal range when stopped down to f/8, but is never "excellent" and sometimes lacks some contrast. Build quality feels good (I like the material of it, and its weight gives a good feeling) but it is subject to zoom creeping when held almost vertically, especially with the hood on. AF operation is fast enough, and not too noisy, but I found it to be sometimes inaccurate at 18mm. This problem dissapears when I use the center AF sensor only (not a big deal for me). The lens hood is supplied with the lens and is very convenient, though beeing shaped to fit the FOV at 18mm it becomes less efficient on the long end." So, this lens is a very good walkaround/vacation lens for APS-C DSLR and its price makes it very attractive too. I absolutely love this lens - it's on my camera 99% of the time. very compact when I travel (along with 50mm f1.8). Kit just never had enough reach for me and felt liek a toy. This lens is relatively heavy for it's size (balance 350D nicely) and feels and looks good with supplied hood. Picked this over the tamron 18-200 for the sharper center (but worse on edges), and non rotating front, and was cheaper used. 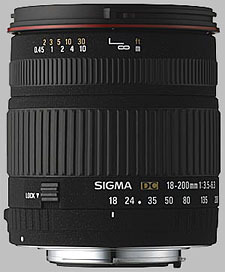 After several months of using the 18-125, I have the chance of test also the 18-200 Sigma lens. These two are pretty the same constructin and size, despite the range difference. The image quality is quite the same, I did not notice a very clear difference, booth offer a good image quality, but this one a larger range and a better macro capability (still far from 1:1, but nice). The size and weight are very good for easy transportation and the range and performance to keep it almost all time on the camera. Of course the long zoom need a short time to avoid blurry pictures, so it is realy usefull for a good light or a tripod is necessary. Now I take 100% of my pictures with this lens. Moderate sharp. It's really an advantage not to change any lenses any more. Lens is cheap and highly recommendable. This lens gives you the convenience of having probably 90% of the focallengths you will need on a APS-C sensor DSLR. As you can imagine, the super zoom range is a compromise on the IQ of this lens, especially on the long end where you have a small maximum aperture. For vacations where critical quality is not as important as packing light, then this is the most convenient lens for its intended audience. For serious pro work, however, IQ is not quite there. It seems that Sigma engineers have done a wise compromise with this lens. They have worked on image quality at the expense of a high degree of distortion. I think it’s a wise solution since distortion is easily corrected via software (I use the excellent PTLens program). The images are crisp and detailed through all the zoom range (simply stop down to f5.6 or f8). I use this lens on my Pentax *istDS and I’ve not experienced any major problem with auto focus. All in all a good lens and a terrific value for the money spent. a pretty good lens for the money. I'll leave a more detailed reveiew after I've had a little more time to shoot with this lens. I tested the zoom of my new 18-200mm Sigma DC against the zoom of my Nikon 55-200mm DX and I found that the zoom on the Sigma is not as good. It almost seems like the lens only does 18-150mm. I'm only a novice at photography, but I set my D50 up on a tripod and shot at a stationary subject using my different lenses. The Sigma just seems to be weaker. I'm not sure if I'm going to keep it because of this. Aside from the zoom, the quality is what you'd expect for the money and it is reasonably sharp. It is a little noisy since it doesn't have a HSM silent AF motor, but that is to be expected. The manual focus grip is a nice size and it moves just the right amount. Not too much, not too little. I just wish the zoom at 200mm was stronger. Very versatile lens, covers most needed range, light & small. none for a lens of this type or cost as far as I am concerned. I pre ordered one of these as soon as my local camera dealer said they were available, and have been very happy I did. After a full year and over 4,000 shots I think it a much better lens than most people give it credit for. Recently I bought a used Canon 17-85 IS lens and a 17-40 F4 L and carefully compared both against the Sigma, and the results were far from expected, the Sigma blows the much more expensive 17-85 away in the wide end, and never really catches up. The very highly rated Canon 17-40 L really wasn't that big of a step up either in the same range that both can cover. For a longer review complete with many full resolution images that you can view or download to compare, which are as shot with no enhancing of any kind use the link provided, the review is on the sister site at Imaging Resource, and was started almost a year ago, and I have finished what I think is a fair test with proof of my findings. I have been using this lens for the past month or so on Nikon D50 plus I use the 18-70 Nikon. Though 18-70 has a slight advantage in terms of image quality when compared at the same focal length and faster, silent focusing but for the range I normally carry this lens whilst traveling. And for all other occasions I use the 18-70 Nikon. I found this lens to be sharp at f8 and f11 with good contrast and color. I opted for this against the Tamron lens after reading a review in some Japanese or Chinese web site. Not that I can read the language but I compared the 100% cropped images and was quite impressed with Sigma 18-200 results. The images I snapped are nice and sharp. But at maximum zoom 200mm I noticed some softness and this I later found out to be due to short focusing. There is a easy fix to this by double focusing or manual over ride at the maximum zoom range. I recently took this too a zoo trip and the images turned out to be nice and sharp, where I used the zoom upto 175mm. I got mine for Australian $460/-. I wish to post some sample images but there is no link to upload here. I would be happy to recommend this lens for the price. sometimes blurred pictures although I thought the picture was sharp in the viewfinder,bur it might be the camera -350D. 90% of all my pictures are taken with this lens.Quite Sharp,warmer than Canon lenses. Fantastic for everyday use and travelling. Vignetting and pincushion at 18mm f/3.5 as expected and no worse than EF-S 18-55mm. At f/3,5 some softness (in my modest vocabulary - I am Danish) equal to unsharpness in all four corners. At f/8 even the corners are then acceptable)At normal apertures percieved quality superior to EF 24-70mm 2,8L! Some CA at f/3,5 is sometimes at hand but not anything like Sony F 828. Lens is cheap and highly recommendable. I have had cameras in my hands for the last 60 years and worked 30 years with Agfa in the engineering application department. This lens surprised me with its image quality. I have not done formal testing, but have done some comparison shots, and have taken a fair number of photos with it, and it is good enough throughout the focal length range to produce useable results on a D2x as long as it is stopped down at least one stop from maximum, preferably two. On the D70, its results look even better when compared with other lenses of similar focal lengths. Corner sharpness does fall off a bit in the 18-28 mm range, even stopped down, but only a bit, and contrast remains reasonably good and there is relatively little visible CA. The close focusing ability is great, and for this the fact that the maximum focal length decreases as you focus closer doesn't hurt--by the minimujm distance, field of view is about the same as a 100mm macro lens, meaning so are depth of field and perspective effects, and I like 100mm macros. The focal length decrease (which does happen in this and many other close-focusing zooms; if you are feeling skeptical do some comparisons at different distances with fixed focal length lenses--shortening the focal length is one way of getting higher reproduction ratios with the same lens extension, and clearly zoom manufacturers take advantage of this) can be annoying if trying to shoot telephoto shots of, for example, small birds at relatively close ranges. By my rough estimation, for example, at about 10 feet the field of view is about the same as that of a 125mm fixed-focal-length lens. You only get the real 200mm at near-inifinty distances. The real minimum focal length is somewhat understated by Sigma, coverage at "18mm" falls almost exactly between the 18-70 Nikkor and my 20/2.8 fixed focal length Nikkor so I would guess it is really about 19mm. Both the D2X and a D70 have trouble with autofocus at focal lengths between about 18 and 30 mm. In this range, their autofocus hunts back and forth quite a bit, and can settle at a place that yields quite unsharp results. I nearly sent the lens back when I first received it, because I was getting very poor results at the wideangle end. Then, alerted by the hunting behavior of the autofocus, I started zooming to 35mm or so, focusing, and keeping focus locked while zooming back out to wider focal lengths. That fixed the problem. I sometimes get some hunting with all wideangle lenses on these cameras, but for some reason this lens is far worse in this respect than others (18-70 Nikkor, 12-24 Nikkor and Sigma) I have used extensively. Build quality seems quite good. It has a pretty solid feel, more like metal than plastic although I guess there is a lot of plastic in there, and mine has survived a horrifying drop about 3 feet onto a linoleum floor while mounted on the D70. It landed partly on the lens, which does not seem to have been affected at all (and neither was the D70). This lens is a compromise in many ways, but it is a compromise that works, and works well, producing very nice photos, if you need to use an all-in-one lens. I haven't used it as much as I had thought I might, but have carried it and the D70 at times when I otherwise would not have had an SLR, and have captured some great images that have printed nicely at 12 X 18 inches.